"Millions of young people affected by conflict around the world are trying to make their voices heard. Whether they do so peacefully depends on their inclusion in communities’ social and political development. The United Nations Population Fund estimates that there are 1.8 billion young people aged 10 to 24 globally; developing this generation into peace builders is widely seen as imperative. 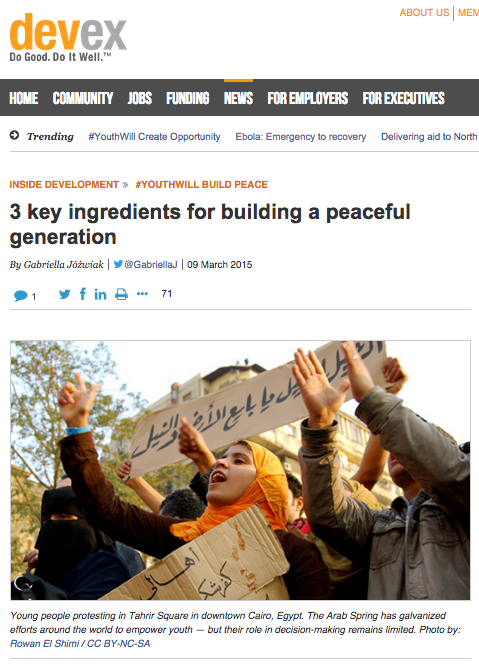 Yet young people working on peace initiatives often lack support identifying and challenging the issues holding them back..."
This is a great post. And the perspective is simple and amazing. Peaceful generation is very important and this post is really helpful for many of us. I think it will be harder for us to build it. Prove me wrong if you can.